Our first winter in Tassie was a cracker. It was really wet, I didn't know any different, I just thought it was always like that. The locals told me it was unusually wet though, and now, after being down in Tassie for a few years I know it was an exceptionally wet winter. We were renting a house at the time, the downstairs room flooded often, the carpet was perpetually wet and moldy. It was very gross, and some of our furniture which was being stored down there was ruined. The grass was just a constant bog, and the veggie garden (yes I did have a successful one!) was a swamp. 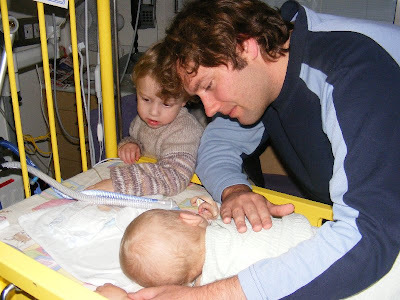 My parents visited us for Voltorb's 3rd Birthday, they arrived at the end of May 2009 and stayed for almost 2 weeks. A few days before they left, Oshawott (just a baby) and I took them to Port Arthur. We had been waiting for the weather to clear up, but it actually rained every single day of their visit. It was the beginning of June, so pretty chilly down there at Port Arthur. The rain didn't help, Oshawott was the only one of us dry and cosy. 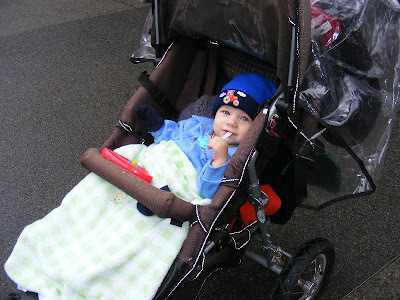 In the covered pram and under several blankets, plus socks on his hands as gloves, he was happy to be pushed around seeing the sights. The day after, Oshawott became sick, seemed like a bad cold, though the rims of his eyes were red also. Off to the Doctors we went. She listened to his chest, checked his breathing and sent us home with antibiotics and instructions to come back in if he got worse. Oshawott, like all of our babies, was breastfed, demand feeding. He was 9 months old and would still wake at night for milk. That night he woke as usual, very unsettled and wouldn't have any milk, he would cry and just go back to sleep on and off, lying on me. In the morning it wasn't good, he still wouldn't have milk, he would try, but cry and go back to sleep in my arms. He was unable to keep his eyes open long. Very concerned at this stage we rang Mum to bring the car (they had driven it to their cabin the night before to save us ferrying them back and forth). She came straight away, we bundled up the other 2 boys and off we went to the hospital, dropping her off on the way, they were leaving that day and needed to get dressed and packed up. On the way to the hospital I remember him sitting in his car seat, lethargic, sleeping on and off. His eyes were red and he was breathing hard. Coder dropped us off and took the older boys home. At hospital we were rushed right in to the Peadiatric emergency ward where he was assessed immediately by the head Doctor. They put him straight on oxygen, his breathing was laboured, he was struggling to take the next breath. Chronic Pneumonia in both lungs was the diagnosis. The Doctor told me Oshawott needed more help, he needed to be put on a CPAP machine. Continuous positive airway pressure (CPAP) is commonly used for those who are critically ill in hospital with respiratory failure. I don't remember everything that was said, I was numb, he told me most people would be crying by this stage. I said I would cry later, it wouldn't help him now. He needed Mummy to be calm, everything was fine. He was being admitted to the Neonatal Intensive Care Unit (NICU). We had to wait for them to prepare the room. We were moved to the "resus" room. This is short for resuscitation. He looked terrible. 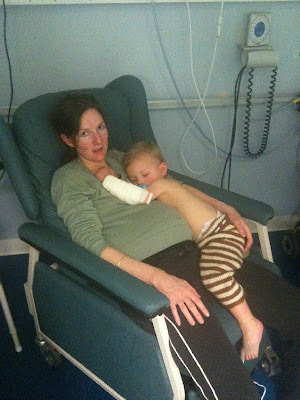 The nurses were lovely, they arranged a breast pump be delivered as I was very uncomfortable and sore by this stage. All I could do was wait. They brought me a meal for lunch, we were still waiting at this stage, and he was still on oxygen. Finally mid afternoon we were moved to the NICU. 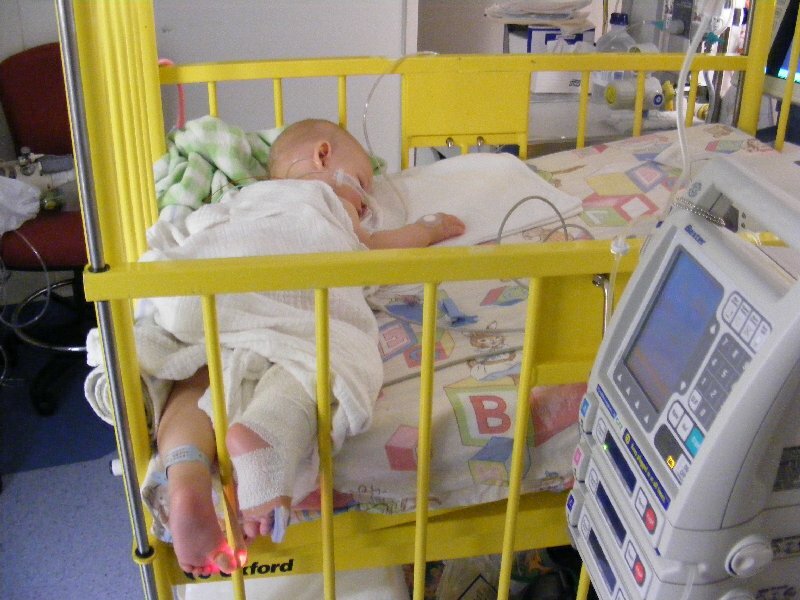 He was in his own glassed room within the unit, a nurse was going to be with him 24/7. He was sedated because he was so exhausted just trying to breathe. The machines were now pushing air into his lungs through a tube in his nose and all we could do was wait. 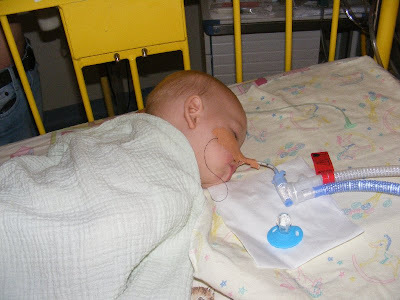 The nurses had to suction secretions and debris from the lower airway using that tube also, this was to keep him from having to work hard too breath. He was also on intravenous antibiotics. While all of this was happening, my parents were waiting to hear some news, they were at the airport, besides themselves. 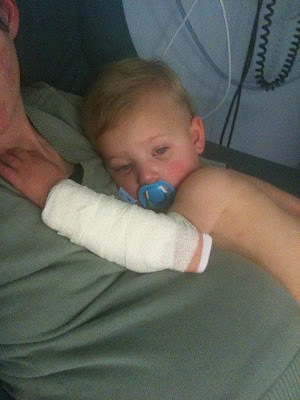 You see, my Grandma had also been admitted to hospital in Broken Hill and my Mum needed to get home to her. She was reacting badly to medication she had been placed on for a collapsed vertebrae and was dehydrated as well. I can't begin to imagine what she was feeling, I was in my own pain at the time. But we have spoken about it since and it was so incredibly difficult for her to get on that plane. She felt so helpless, all she knew was that he had pneumonia, she had no way of knowing how bad it was going to be. After dropping my parents at the airport, Coder dropped the two other boys at a friends and came up to the hospital. By that stage we were just being moved to the NICU. He was distraught. Coder does not handle situations like this well, at all. He had brought up a few things I would need for staying overnight, at this stage I still thought we'd just be home the next day. 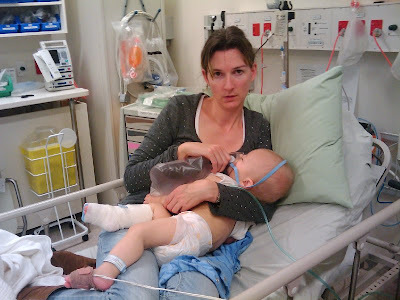 He took a photo of us in Resus, using his phone, just before we were wheeled off to the NICU. He said he felt like a real jerk taking that photo, but I have explained to him, we didn't know what was happening, and whatever the outcome we would, one day, want photos. Our first night in hospital was strangely ok from my perspective, but only because I was asleep. Oshawott was still sedated, so he slept, and so did I. I was so emotionally and physically exhausted, and the nurses were under instruction to wake me if he stirred. He was given breast milk (I had to pump regularly) through a tube every few hours. They wanted (needed) him to sleep, to regain and retain his strength. We tried to keep everyone informed, but there really wasn't much to say most of the time, it was just a waiting game. 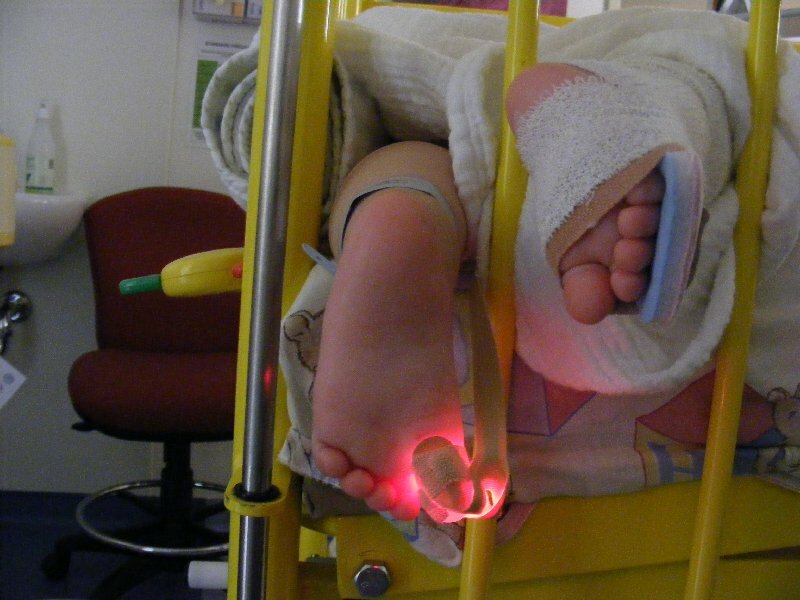 The doctors visited often, checking on his progress and altering amounts of this and that. 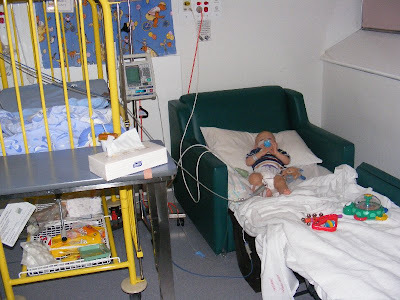 It was during that first full day we spent in the NICU that the head Paediatrician told me that, that was it, (after assessing him and changing some things), there was nothing else he could increase, if he didn't improve soon he would have to be incubated. All we could do was wait. And Pray. I had another night sleeping in the waiting room (on a bed the kind nurses had set up for me), they also sent me down to the cafeteria with a voucher for dinner. The next day we had good news. He was improving! 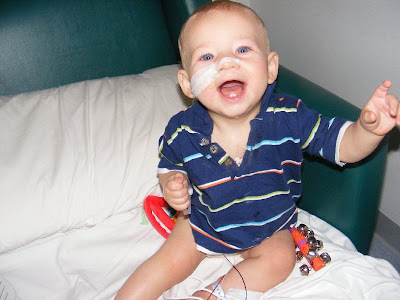 They stopped sedating him and he was allowed out for cuddles later that afternoon and had some milk, from Mummy, not a tube. Coder came up for a visit after dropping Legoman off at a friends. He had Voltorb with him. Little (just turned) 3 year old Voltorb didn't quite know what to make of all the machines and beeping. But he knew it wasn't good, so we made a quick swap and I was off to get some much needed fresh air. I took Voltorb out for a walk in the Mall while Coder sat with Oshawott on his lap, having Daddy cuddles. 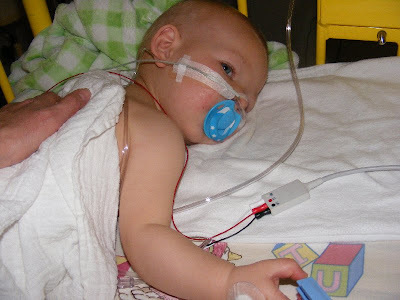 It was awkward to get him in and out of his cot with so many tubes and wires attached. 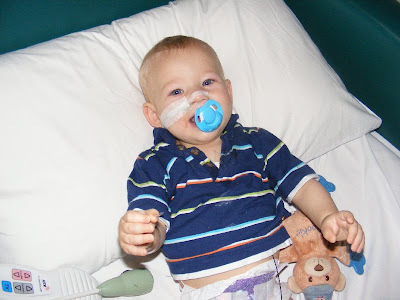 The head Paediatrician told me during one of the more happier rounds (where he had improved and was off CPAP, and just now with a nose tube for oxygen), that when we had arrived, Oshawott was an hour away from heaven. This struck me hard. I had no idea. I did know it was bad, I didn't know it was that bad. I think I was in denial, we were at the hospital, everything is ok now. It very well might not have been. 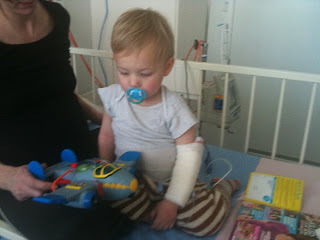 I am so forever thankful to all of the staff at the Royal Hobart Hospital, they are amazing. And to our families and friends for their support and prayers. 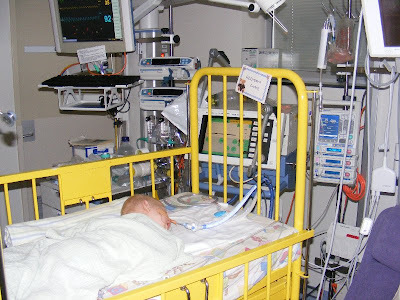 After 3 long days and nights in the NICU we were moved to the paediatric ward. He was still on oxygen, antibiotics and was still being suctioned, but no longer required a nurse at his bedside 24 hours a day. We spent 2 nights here before being allowed home. During the early evening on our last night we had a visit from the Doctor. Oshawott had Pertussis (Whooping Cough). Ludicrous! He has been immunised! 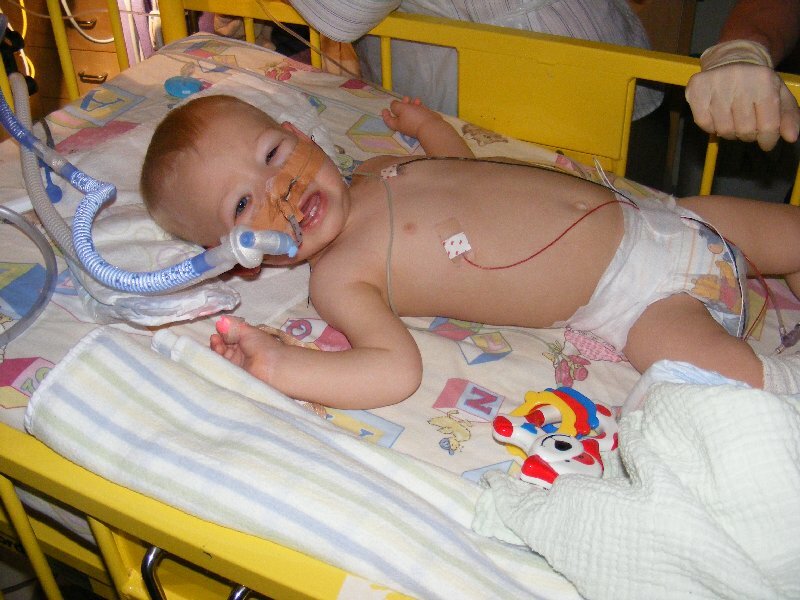 He hardly even coughed, I'm not sure if he even did, which is why it was not even considered as being the cause. Once fully immunised against Pertussis you still are only 85% 'safe' from contracting it. Of course we are in the 15%, so incredibly unlucky that someone probably just coughed in the supermarket while we were passing them. Since then whooping cough outbreaks have been numerous and many campaigns have been put in place to encourage adults to get a booster. For our last night Oshawott and I were moved to isolation. We didn't have many visits from nurses, only when the obs needed to be carried out, and the catering staff would kit themselves out in protective gear before coming in. First bath in 5 days. All the tubes and wires removed at last! The next day we were sent home on house arrest, all of us had to be on anti-biotics. I even had a phone call from Public Health! It was very intimidating. Coder and I immediately got boosters, as did our family members. Anyone over 16 should have a booster for Whooping Cough. Please get a booster if you haven't. 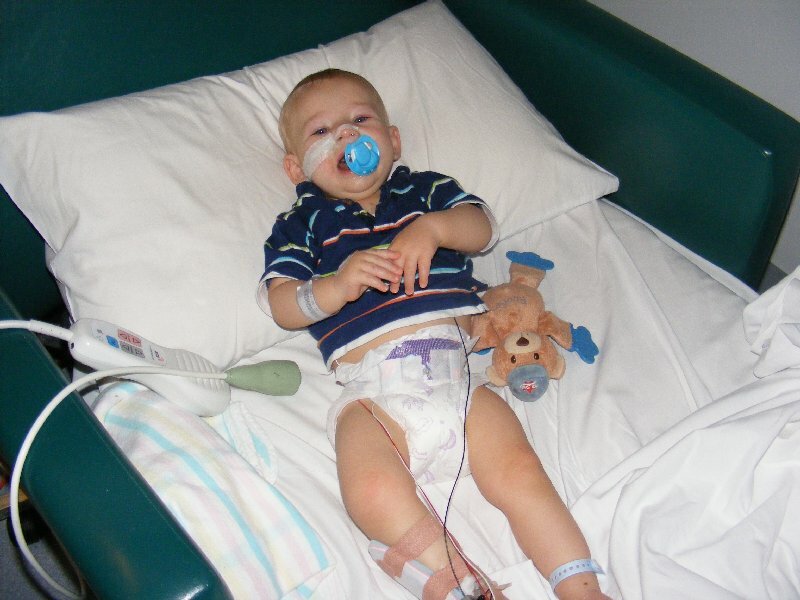 It is common for adults (and children) to have the disease without even knowing it. But it's the newborns (under 2 months) with no protection against it, it's the young and the elderly that could end up fighting for their lives if they were to contract it. The following winter Oshawott again ended up in hospital with pneumonia, just 2 nights this time, intravenous anti-biotics but no oxygen. We got off lightly that year. 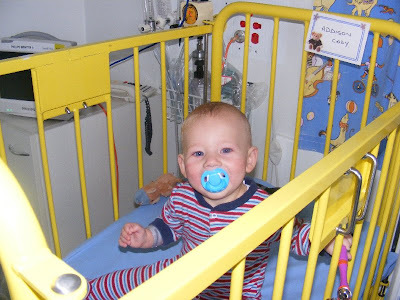 When he is sick now, we always err on the side of caution and will take him to the Doctor or ER if we think his breathing rate seems to be increased or laboured. They have questioned why we would even bother (basically inferring it) bringing him in, until they read his file and his history of Pneumonia. Then they understand and are happy to check him out send us straight home. 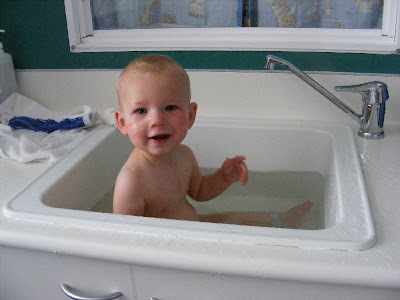 July 2010, one month before he turned 2.
keeping the baby safe from germs! We are big supporters of the Royal Hobart Hospital, any fundraiser that comes up, we always contribute. I feel really relieved to have written this. I think I cried more writing this and looking at the photos then I did when it was all happening. Oh my! I just read all this and it made me want to cry too- how terrifying! You really don't realise how precious and fragile these babies of ours are until something goes wrong, do you? So glad he is okay now! Wow , how scary. 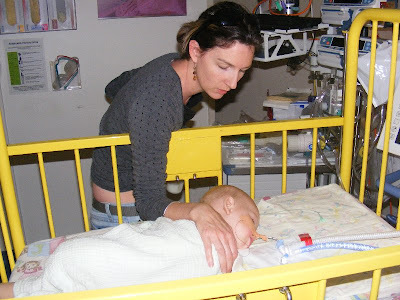 I nursed a few babes/children with Pertussis and it was horrible seeing them struggle to breathe.